Gov. 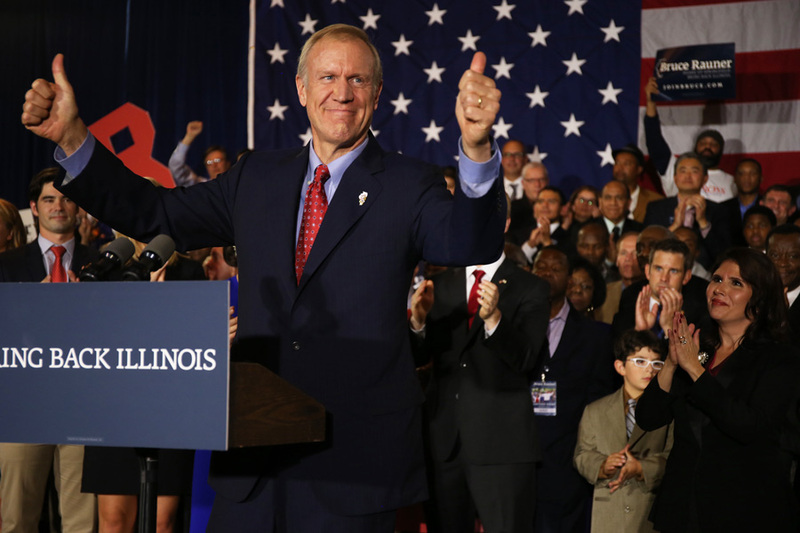 Bruce Rauner declares victory on election night celebration in 2014. Rauner unveiled plans recently to combat hate crimes in Illinois. In light of the recent nationwide attacks on Jewish community centers, synagogues and cemeteries, Gov. Bruce Rauner unveiled new plans last month to combat hate crimes across the state. Rauner announced in March that Illinois will work to expand education on hate crimes in schools and will consider legislation to better address the issue. He also said he was considering legislation that would ban state contracts with companies that boycott Israel. During a press conference on March 30, Rauner said the state will work with the Simon Wiesenthal Center — an international Jewish human rights organization — to expand anti-hate education in Illinois schools to combat anti-Semitism and other hate crimes. “The Simon Wiesenthal Center is grateful for Gov. Rauner taking a leadership position … in supporting our ongoing efforts to combat racism, anti-Semitism and extremism, especially on social media,” Rabbi Abraham Cooper, associate dean of the Simon Wiesenthal Center, said in a news release. Rauner has also introduced a four-point plan to combat hate crimes and anti-Semitism in the state. The plan involves strengthening the state’s hate crime law and supporting legislation that would increase penalties for acts of vandalism against religious centers and places of worship. Additionally, the plan includes measures to expand education about hate crimes in Illinois schools, and improving training for state troopers and local law enforcement officers on identifying, investigating and prosecuting hate crimes. The state will work with the Illinois State Police and Anti-Defamation League in designing a training plan for law enforcement officers around the state, Rauner said Monday during a press conference. The final purpose of Rauner’s initiative is a proposal for Illinois to prohibit state contracts with companies that boycott or divest from Israel. Lawmakers passed a measure in 2015 that made Illinois the first state in the country to prevent state pension funds from being invested in companies that boycott Israel. Rauner’s plan aims to expand on that measure. The American Civil Liberties Union of Illinois opposed the 2015 measure relating to boycotts against Israel.